Paige Drobny has scratched from the 2018 Yukon Quest. First place went to Allen Moore this morning. It’s his third Yukon Quest title, and he earned it without dropping a single dog. Moore crossed the finish line just before 8 am PST this morning. The rest of the pack is still on the trail. In second position is 2017 Quest champion Matt Hall. The Two Rivers musher left Braeburn, the final checkpoint, just after midnight this morning. In third and fourth position are the two youngest mushers in this year’s race. Twenty-one-year-old veteran Laura Neese holds third position. She checked out of Braeburn around 3 am today, down to 8 of her original 14 dogs. In fourth position is Quest rookie Vebjorn Aishana Reitan, also 21-years-old. He left Braeburn three hours after Neese, just after 6 am. Ed Hopkins followed Reitan out of Braeburn at 8:40 am PST this morning. The other 9 remaining mushers have yet to reach Braeburn. They’ll take a mandatory 8-hour layover at the final checkpoint before heading back out for the final stretch of the race. Allen Moore has claimed his third Yukon Quest title. Just before 8 am PST this morning, Moore mushed into Whitehorse, the finish line for this 1,000 mile international sled dog race. 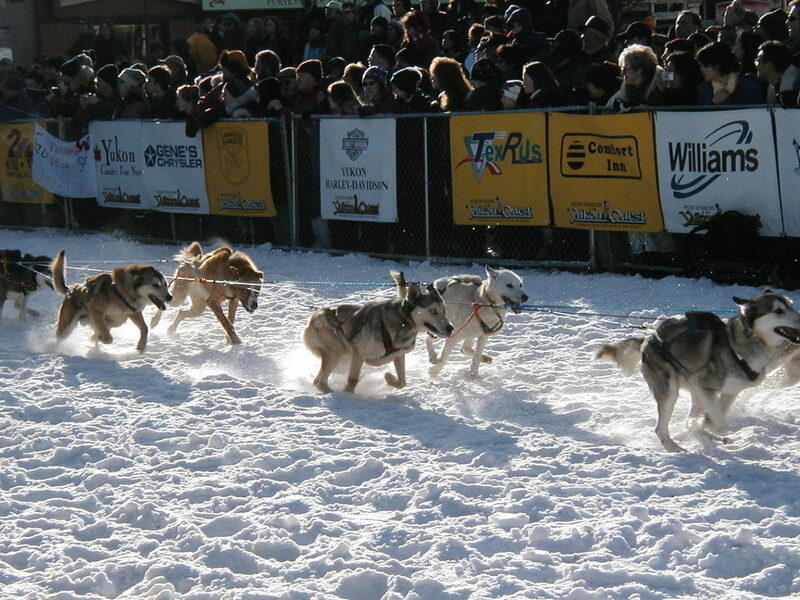 The veteran musher from Two Rivers took the win home with all of the dogs he started with. Moore, Aliy Zirkle’s husband, came into this year’s Quest with 14 dogs from his shared kennel with Zirkle, and did not drop a single one. Matt Hall holds on to second position and closed the gap between himself and Moore, but it wasn’t enough. Hall left Braeburn about five hours behind Moore, just after 12 am this morning. Third position is now held by Laura Neese, who dropped another dog in Braeburn before departing at 3:01 am PST. Quest rookie Vebjorn Aishana Reitan has surpassed Ed Hopkins, and is now in fourth heading towards Whitehorse at 6:08 am PST. Hopkins rounds out the top five, leaving Braeburn at 8:40 am PST after finishing his mandatory 8-hour layover. I love watching the lives of the Alaskan people on TV here in Boston , Ma. I admire their hard work, love of earth and respect for the animals with whom they co- Habitat.